ABS Journeyman smith, Bill Sowell crafted this forged Bowie. 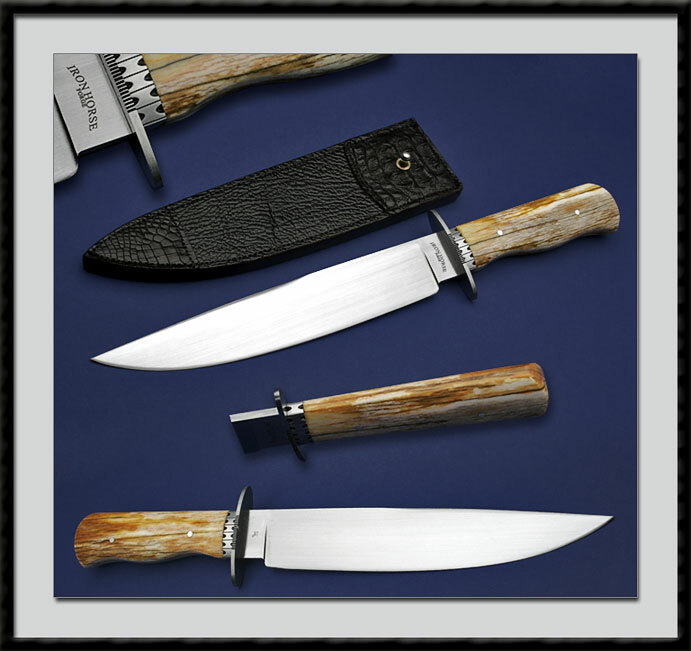 BL = 10 1/8", OAL = 15 7/8", 1084 Blade steel, Hand rubbed satin finish, Distal taper, edge hardened, Heat treated in Liquid Salt, 416 SS Guard with a file worked Ferrule, Outstanding Stabilized Giraffe Bone Mortised Handle accented by 2x Sterling Silver pins. While a Left handed sheath is pictured a choice of an identical Right Handed sheath is offered for those who want one. Bill's custom sheath is made of Shark Skin and Crocodile Hide. Condition is New, direct from Bill's shop. A Quality piece with Fit & Finish beyond that of a Journeyman smith.